This audio description has been compiled by Colin Hambrook in February 2018. It was commissioned by Disability Arts Online on behalf of NDACA (the National Disability Arts Collection and Archive). It is approximately 10 minutes 20 seconds long. This is a flyer promoting a cabaret produced by the London Disability Arts Forum, designed in a Gravitas One font – a typical poster font with both bold and very narrow verticals. The text is in red lettering on an orange and white background. A loose line drawing of Allan Sutherland performing features in two sets, reversed, in red on the header and in orange on the main poster image. The drawing looks a little like a Boz illustration from a 19th century novel. An assembly of long coat and scarf – material flying as though he’s struggling to put it on. Strands of fabric are caught under his bare feet. He wears a brimmed hat and glasses. The sketch is by Katherine Araniello whose signature appears beneath. A border made of two red lines with an orange fill surrounds the edge of the flyer. The headline reads: ‘The Workhouse: Disability Arts Cabaret Double Bill’ in block capitals across three lines in red lettering on white. An exception are the ‘O’s in Workhouse, which appear in orange. The full address and phone number of the Red Rose Club, Islington is in red lettering on a band of orange below. Underneath ranged-left the flyer reads: Monday 26th November ’90, “new talent night: a galaxy of rising stars” in lower case, followed by the names of the cabaret acts: Sarah Scott and Ray Harrison Graham, Sharon Knight, Astrid Menezes, Maudie and Harry, Jeff McWhinney, And Mario Estrada from the Nicaraguan Disabled People’s Freedom Organisation ‘Solidez’. MC Elspeth Morrison. Below ranged-right is the date: Monday 17th December ’90, “Workhouse golden oldies sixties Xmas Party Night, false eyelashes, bell bottoms etc. de rigeur and food laid on” with the names of the performers: Johnnie Crescendo, Isobel Ward, Allan Sutherland, Kate Portal, the Pink Fingers and introducing Phil Troll. Logos for Islington Council, Greater London Authority and London Disability Arts Forum (LDAF pronounced el-daff) appear lined up below the text. The footer in red on orange gives the details: time, ticket price, £3.00 or £1.50 access and LDAF information phone number. 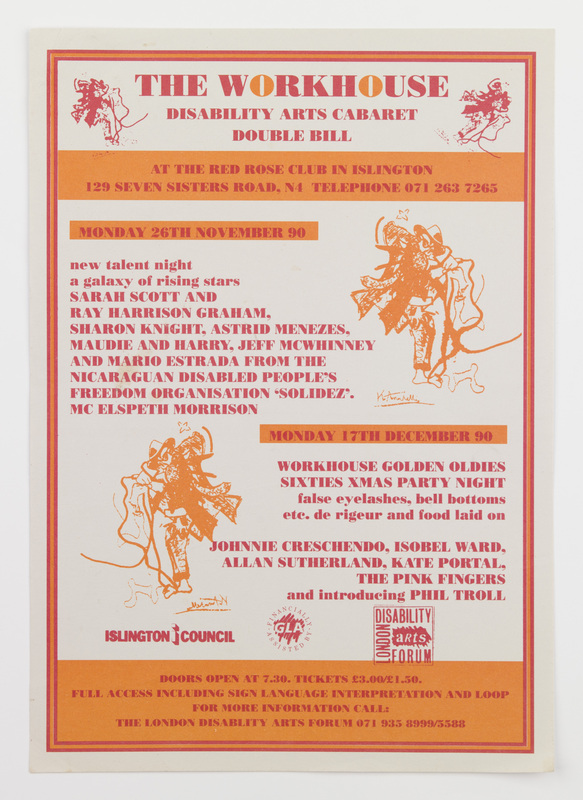 LDAF launched The Workhouse disability cabaret club at the Tabernacle Arts Centre in West London in 1988. LDAF, set up in 1987, was an organisation controlled by disabled people; employing only disabled people, it became a model for the creation of disability arts organisations across the UK in 80s and 90s. The Workhouse cabaret – named after the Victorian Workhouse – the forerunner for residential homes, institutions and hospitals where disabled people lived – provided a space where disabled audiences could come to enjoy the work of disabled performers. Like the disability movement of the time, the workhouse brought together people with a wide range of impairments, rejecting the impairment-specific model of organisation offered by the disability charities. Subjects for performance within the variety acts who featured within The Workhouse spoke often of disability issues and patronisation, discrimination, access, and stereotypes with frequent criticism of charities and the medical model of disability, which defines disabled people by the nature of their condition, rather than as human beings in their own right. As the Workhouse developed so did the politics. The early act of Johnny Crescendo (Alan Holdsworth) included classic blues songs chosen for their disability relevance such as Ted Hawkins’ tender “Sorry You’re Sick’ and Big Bill Broonzy’s impassioned song about civil rights, ‘I Wonder When’. Johnny Crescendo began writing material aimed directly at the disability audience. Some performers on the bill of the December 1990 Workhouse went on to further innovation. Jeff McWhinney, for example, went on to introduce the videophone to the deaf community in the early 2000s. A One World Action publication from 2001 ‘Learning from experience’ outlines the impact of Solidez in its aim to strengthen organisations of disabled women in Nicaragua. The Workhouse took place at a number of different venues, but there were always two basic ground rules: the event must be fully accessible for disabled people – and it must have a bar. The Red Rose Club became a popular host when Albany Video produced ‘The Disabling Council’ – a training video on Disability Equality or the Local Government Training Board – and produced a cabaret specifically for the video. The video consists of interviews with disabled people, all of whom worked in local government apart from academic Mike Oliver, interspersed with songs and comedy material by disabled performers. Its central concept is disability as a social construction. Disability on Equal Terms: Chapter 7 Choices, Rights and Cabaret: Disability Arts and Collective Identity by Allan Sutherland. It was commissioned as part of a series of 1000-word essays to mark the launch of NDACA, funded by the Heritage Lottery Fund, Joseph Rowntree Foundation and Arts Council England.